Bob Dylan celebrated his 70th birthday yesterday. That number has great significance in Judaism. King David lived to be 70 and it is thought that 70 is the lifespan of man. This is the reason that a second bar mitzvah is observed at age 83 (70+13). I remember listening to this song in a wonderful course I took in rabbinical school at the Jewish Theological Seminary. The course, taught by Prof. Rabbi Neil Gillman, looked at different artistic representations of the binding of Isaac. I'm sure Dylan would get a kick out of the fact that his song was being studied by future rabbis at the Seminary. By the way, it's interesting to note that Dylan's father's name was Abraham so perhaps the song had personal meaning for him as well. Bob Dylan was born Jewish, became a bar mitzvah, and then converted to Christianity in the 1970s. In recent years, Dylan has embraced his Jewish roots. 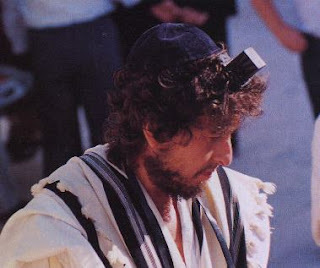 Michael Billig wrote an informative article for MyJewishLearning.com about Bob Dylan's views on religion. I wanted to draw your attention to the song "Abraham" - by one of my favorite artists and Detroit native (and non-Jew) Sufjan Stevens.